When you renovate a palatial, historic landmark on one of the most famously elegant squares in one of the most fabled travel destinations in the world, there's a lot at stake. 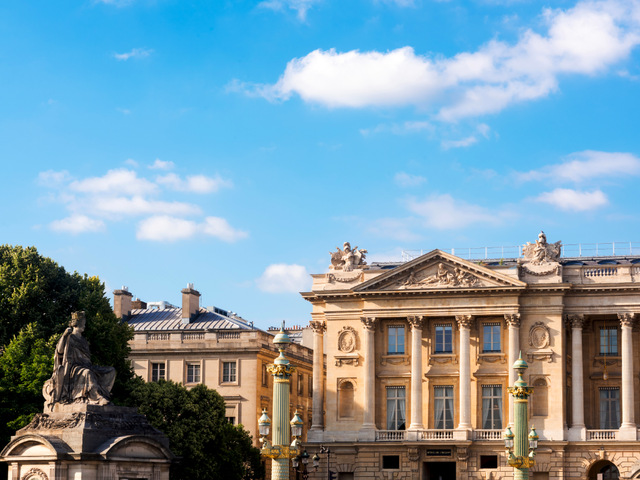 The Hotel de Crillon has dominated Paris' storied Place de la Concorde since the 1700's. Originally the Parisian home of the illustrious Count de Crillon, the palace has been the site of world-changing events, where Marie Antoinette had music lessons, international treaties were signed (including French recognition of the American Declaration of Independence), and a hotel since 1909 where celebrities, aristocracy, royalty, politicians and artists continued to make history. Now after its 4-year renovation, its latest re-invention has been revealed. We aren't disappointed. 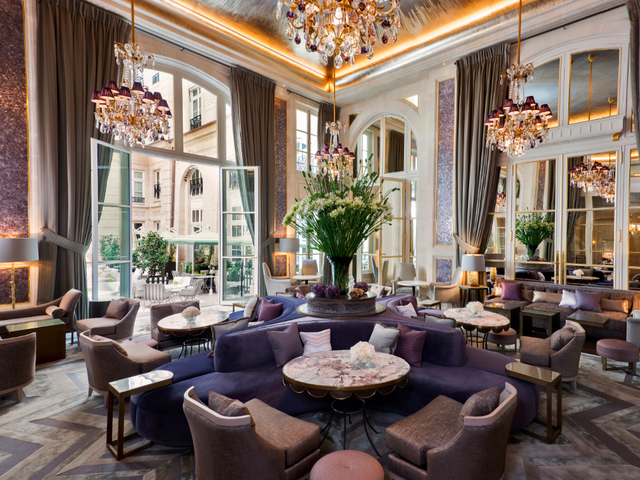 With incredible vision and work by world-renowned architects, designers, artists and artisans - even an artistic director – the Hotel de Crillon is back, a palace reinterpreted for the modern day luxury traveller. Imagine the challenge: to strike a balance between conservation and transformation. But the hotel has emerged as an elegant expression of the spirit of Paris and a celebration of French art de vivre. The opulence remains. It is awe-inspiring, bridging the 18th and 21st centuries – and still oh so very Parisian: exquisite, elegant and a bit irreverent. The exquisite Neoclassical façade and grand reception rooms on the second floor are classified heritage landmarks, so designers were working with a heritage building. But everywhere you can discover a fresh and modern twist, even as beloved and unique objects, that are symbols of the hotel’s history, can still be found throughout the property, from the amethyst chandeliers to gold and crystal Baccarat decanters. 124 Guestrooms: 78 Rooms, 36 suites, and 10 signature suites elegantly decorated with bespoke furnishings, beautiful antiques and carefully chosen objets d’art. 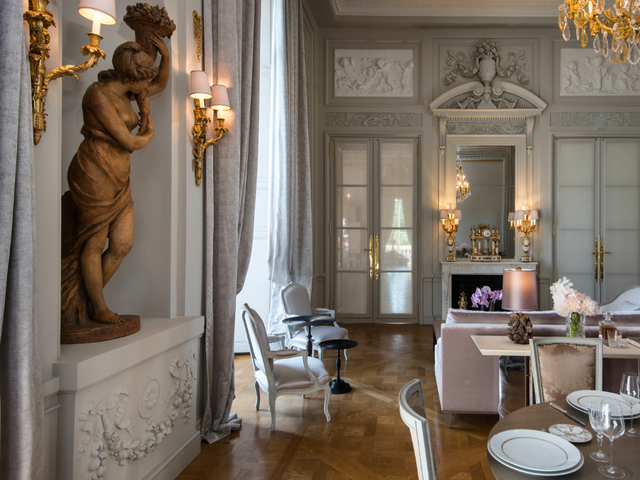 The hotel’s 10 signature suites are the crown jewels of Hôtel de Crillon, and considered among the very finest in Paris. 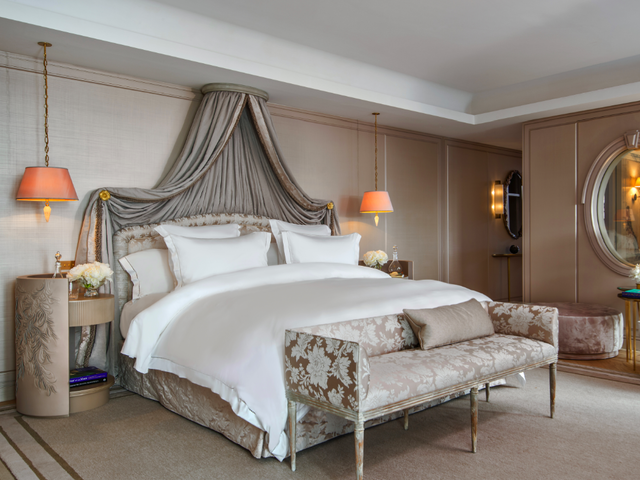 The Louis XV boasts a stunning private terrace with picture-perfect views of the Eiffel Tower, while the Marie-Antoinette suite reflects a regal, feminine spirit with pearl-gray décor and touches of rosy pink. Karl Lagerfeld, renowned designer of the house of Chanel and a great 18th century admirer, decorated the two exceptional suites on Place de la Concorde which embody his personal vision of French chic and modernity. The salons are listed heritage landmarks, with soaring six meter ceilings dating from 1775-1776; French interior palace design of adjoining rooms allows them to be opened and joined for larger events. 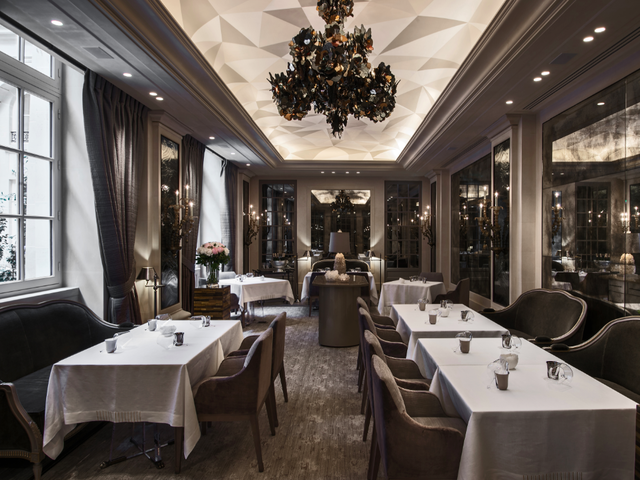 Les Ambassadeurs, the chic 60-seat bar that is the new place to see and be seen in Paris. 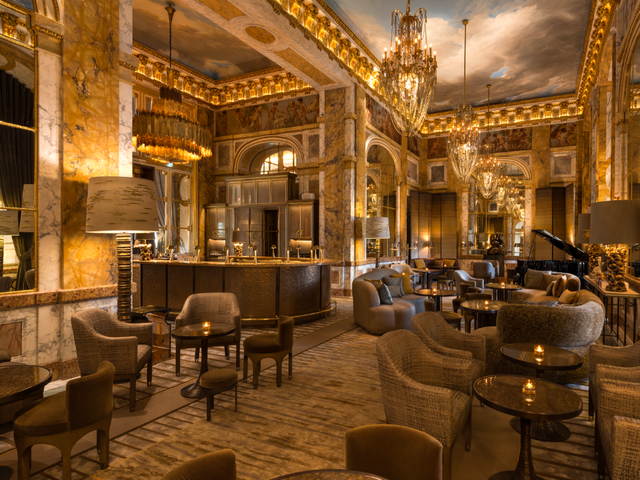 A festive vibe animates the heritage setting (the ceiling is a registered landmark) thanks to live music nightly, meticulously crafted cocktails, and an exclusive carte of prestigious champagnes. Whimsical courtyards by a renowned French landscape architect. A newly created swimming pool graced by a mural by a noted ceramic artist, fitness studio, and full-service Sense, A Rosewood Spa for wellness-conscious and stylish guests. Sophisticated style and grooming venues for men and women, including Hair Salon by David Lucas, Barber by La Barbière de Paris, and Shoecare by Devoirdecourt. Hôtel de Crillon has long since secured its iconic status as a one-of-a-kind hotel destination, a living testament to the very best way of life France has to offer. 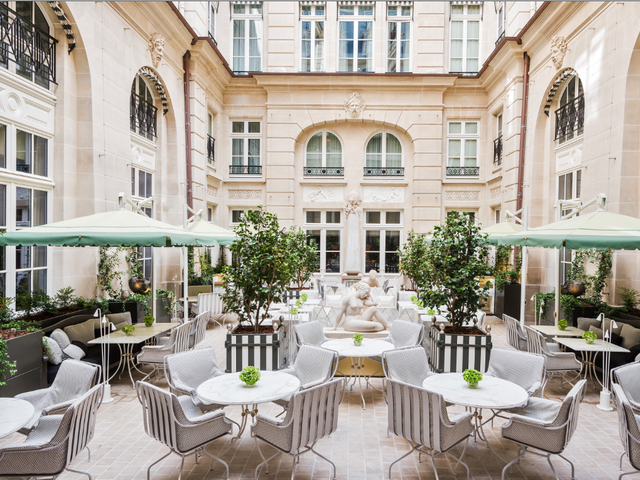 Its rebirth radiates timeless, chic contemporary French lifestyle in an undeniably luxuriant historic setting. Book Now and Save More! 10% Off Your Next Luxury Silversea Cruise - Book by April 30! Video: Is this the 'Most Luxurious Ship at Sea'?